Meet the Cuddle Me Puppy. This is a BIG puppy, standing about 20 inches tall if you use the same yarn and hook size given in the supplies list. It IS a cuddle size! There are a pair of overalls for the puppy to wear here. I've done my very best to explain everything as much as possible. I have provided a full video tutorial for the assembly of this puppy. The assembly section is on a separate page with lots of photos. View that page here where you will also find the video links. I do not have a video, yet, for crocheting the parts. I will add links here as more videos become available. Want to share this pattern? Do not copy. You can use one photo and provide a link back to the pattern. 1 roll of Red Heart Comfort yarn or 2 rolls of Red Heart Super Saver. For the white puppy pictured I used 1 full roll of Super Saver (364 yrds) to make the head, body, arms, muzzle, and eyelids. I used a small amount of the 2nd roll to make the legs. A small amount of an alternate color to make the ears, tail, and paw pads. Small amount of yarn for nose. Important: This pattern will be difficult to do if you use a cotton yarn, I strongly recommend an acrylic, however, if you want to try it in miniature than a cotton will work fine. This pattern requires a tighter tension when decreasing the neck area and last few rows of the body so an acrylic will be much easier on your hands. Eyes: you can use buttons, felt, paint, safety eyes or crochet them. It's up to you. I used 20mm safety eyes on the pups pictured. You can even go bigger, I think larger eyes would be cute but I didn't have any larger ones. 20 ounce bag of polyester stuffing. You will use most of it. EYES: Placements are up to you since it's personal preference. I put the white puppy's eyes in between the 15th and 16th row, and the grey puppy eyes are in between the 16th and 17th. Both have about 9 visible stitch holes between them. (I counted the stitch holes under the felt piece). If you plan on making a patch for the one eye, then just attach the one eye. The 2nd eye gets attached to the patch itself and that is sewn on after the puppy is stuffed and closed. See assembly instructions, link to assembly page is at the bottom of this pattern. *if you start to see gaps while you decrease then try the inv dec by crocheting in the front loops only when crocheting 2tog. *The next few rows will feel awkward to crochet but it will get easier as the body gets larger. * Stuff majority of head. 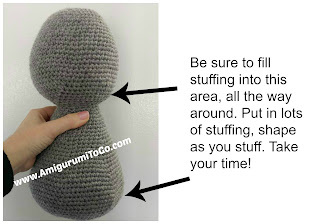 Push the stuffing to the top of the head then make sure to gt stuffing all around the sides of the face and neck area. Shape as you stuff. It will take lots of stuffing. You will stuff more in a few more rows. * Stuff more into the head now if needed. Make sure to get any gaps filled with stuffing. Push stuffing into the bottom of the face, all around. It takes lots of stuffing. * Stuff the majority of the body now. Be sure to fill any gaps in the neck area. Stuff it firm and full or the neck will be floppy. You will add more stuffing over the next rows. *The next rows, and until you close the body, will feel a bit more difficult as it's harder to keep the tension once the body has been stuffed, if you stuffed it enough. Hang in there! Keep your tension tight, you're almost done. *Stuff more. Push stuffing into the sides and all around the bottom. *Stuff more.. be sure to get all around the bottom and in the middle. The belly should be nice and fat. f/o leaving a tail for closing up the gap. Weave in and out of the remaining stitches. Add more stuffing as needed then pull yarn tail tight to close gap. Knot off and hide yarn tail in the body. 1) magic circle or adjustable loop with 6st (6) No need to pull the center hole too tight as you will go through this hole when you whip stitch the nose in. See the assembly page here for how to stitch the nose in. 32) do not stuff, fold ear flat and sc through both sides across. *stuff hand once you got 5 rows done. Stuff arm as you go. Leave the last 6 rows unstuffed. 36) fold top of arm flat and sc through both sides across. f/o leaving a long tail for sewing. *stuff foot after you get 5 rows done. It'll take lots of stuffing. Stuff leg as you go along, leave the last 3 or 4 rows unstuffed. When you stuff the foot, push the stuffing into the sides to shape it, also stuff towards what will be the heel of the foot, this is important for shaping. 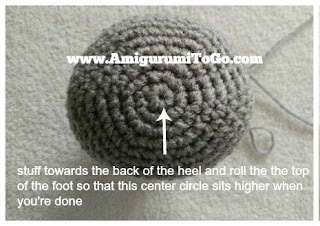 The middle circle or row 1 should be up higher, towards the top of the foot when you're done. See photos below. 37) Depending on where the last stitch of the last row ended you will have to sc around until you reach the side of the leg. The leg will look twisted if you don't get to the side, it's easier to sc to the side then have to play around with the shape after you close up the leg. Fold flat then sc through both sides of the leg across. 38) ch1 turn, skip ch and put 1sc in each st across. How to make the toes is shown in the ASSEMBLY section. See bottom of page for link. Eye Patch: *Optional ~ you can leave this off. *note: the patch looks bigger in the video as I had added 1 more row, later I decided to remove that row. Eye lids: If you use the eye patch then make one in body color and one same color as eye patch. If you do not use the eye patch then make 2 the same color as the body. 1) ch8 *starting tail should be long enough to sew into head. 6-22) 1sc in each st for 17 rows *stuff as you go, leaving the last 2 or 3 rows unstuffed. 23) fold top of tail flat and sc through both sides across. I have put the ASSEMBLY section on a separate post. Please click here for assembly instructions. Such a cute little puppy, thank you SO MUCH. Your tutorials are fabulous! I haven't been crocheting much and I knew I wanted to make this puppy for my 2 year old. As soon as i showed him your puppy photos he yelled "puppy!" Thank you so much. I can't wait to get started! Thank you so much for another great pattern! I love all your patterns. I just finished up your Valentine Bear , but I added a graduation cap to it for my niece. I cant wait to start on this adorable puppy. Thanks again. I can't wait to start this one! I do not see the Print button anywhere, so I will just 'copy/paste' into a Word document. Just wondering if I missed it somewhere! it's at the bottom, under the donation option. Donating is not required to use it, that's just where it is. It's a green button. Yes, the clothes are coming. If you look in the introduction, the paragraph just under the very first photo, that's where I talk about the pattern, any additions to be added, if there's videos and so on. Thank you so much, I really love this fantastic doggie. So cuddly! Thank you so much for the "Print Friendly " button, easier to keep in a file and print. I follow your work for a long time and love it. I love this big, cuddly puppy! I love all your patterns and have made many of them. Fit Christmas last year, I made 3 dragons, 2 for my grandchildren and they loved them! I think this pattern will be for this Christmas! Thanks for all your wonderful work! Looking forward to the kitten pattern. Sharon Ojala, I love your patterns, I have printed many of them, but I want to tell you that this one looks so much like one I designed a few months ago at the request of another group member on Face Book. I posted it for free on the group. I am shocked! can you give a link to the one you designed? Or the name of your group... I'll have a look. in 7 yrs of designing this is a first that anyone has left a comment like yours. Unless I am completely misunderstanding what you are saying. Hopefully you follow up so I can see the dog you made. I haven't had the chance yet.. hoping to work on it tonight. Sorry for the delay! Hello Sharon, Thank you for this wonderful pattern. 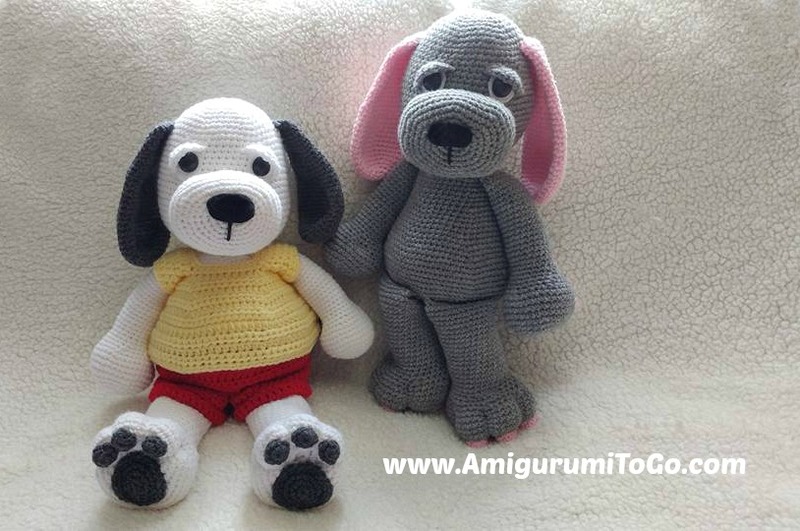 My question is: I made your small bear amigurumitogo from a large skein of Comfort Yarn. Will I have enough yarn for the Cuddle Me Puppy without purchasing more yarn in the main color? Thank you so much for your response. Can you tell me the difference between Comfort yarn and Super Saver yarn. Can you please make another eye lid pattern for smaller safety eyes also? 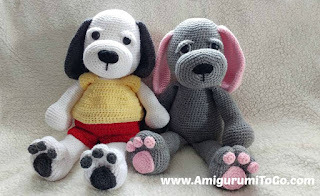 Is there a way to make the puppy bigger besides doubling the yarn. for smaller lids just make a shorter chain to start off with. Instead of doubling the yarn, try a bulky yarn and a bigger hook. Hope that helps! Hi Sharon, I am anxiously awaiting for the pattern to the shirt and shorts for the cuddle me puppy. I have loved all your patterns. There's an abbreviation chart at the top that tells you what each term means. My patterns are in US terms. If you missed the abr chart you may have missed the "read me"section, located just under that, where I tell you how to read the rows. It would be useful for you to read that as well. Thanks for asking! I read the abbreviation chart at the beginning but you don't explain what a stitch is.. A stitch can be a double or treble or half double. That is what I'm trying to clarify. It's very confusing for newbies with different terminology but every pattern I've read has tr (treble) dc (double) hdc (half) but no charts have I read just states stitch..
my apologies. If it were any of those I would have said so in the pattern for sure. All my patterns on this blog work with single crochet stitches unless otherwise stated. This puppy pattern is worked up with single crochet stitches. In row 1, the pattern says make a loop with 6st. That would be 6 single crochet stitches. There's 2 options to start row 1, each option is a link to a video tutorial that will clarify that. No worries :) All the best and have fun. It's a large pattern so take your time and take breaks when you need them. I'm always close by if you have any other questions. continuous rounds. 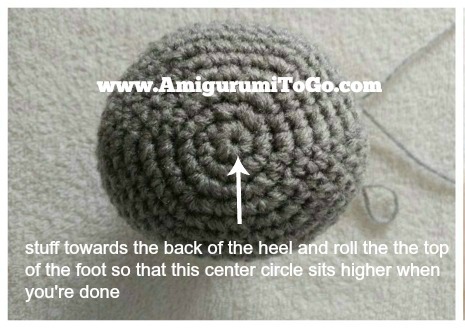 Most amigurumi is done in continuous rounds unless otherwise specified. I hope you enjoy the pattern! It's a whopper of a pattern to start off with, lol but I'm sure you'll do just fine. I have videos for the most difficult parts. Please don't hesitate to ask questions, I'm always close by :) Happy crocheting! Loving this. And this is my 3rd thing made from your patterns. My question is how can I change this from a puppy to a cat? I know I would remove the muzzle. But I'm having problems with how I would do the ears. Any help you can give me would be greatly appreciated! Adorable pattern Sharon! I've already made one for my daughter and just had to make one for myself. One slight problem I found when making the arms was that you listed the last rows as being 21, but if done as listed then you only end up with a total of 35 rows instead of 36 final rows. So should that be 21 rows ending with 35 total rows, or should it be 22 rows ending with 36 final rows? Btw I'm not counting the closing row in any of that. hi Sharon just wondering what colour/yarn you used for your white puppy? Im using the white now but for the ears and tail do i have to use the same yarn as the puppy itself? or can i use different? Hi Sharon, Just a small question. On the gray/pink puppy, did you do a two-toned ear or just pink. I would love to try to make the inside of the ear pink. Thanks, was just wondering what you did. Thank you so much for this pattern. I found in it October after I lost my puppy of almost 12 years. It was like therapy for me to make mine. Then people started seeing it and asking for them. I have made 9 so far in all kinds of colors. They all turn out precious. I even donated one to my vets office for a raffle/silent auction (?) for help with expenses he has for his work with rescue animals. Thanks again for the pattern and for the quick reply. what an honor to know that this pattern helped! So sorry for your loss. 12 years is a long time, I imagine it was like losing a family member. Thanks for making that donation, that was very kind of you. All the best and happy crocheting! Love your patterns,Thank you so much,Going to start the puppy again Thank you. I have made a couple of these pups and they turned out so cute. Your instructions are SO MUCH BETTER than others I have seen and tried. Besides crocheting, you have a real talent putting it into words we can all understand better. Thank you!! Dear Sharon. A year ago I was dignosed with depression and I tryly feel tired and sad. I really want to thank you, because after finding your page and patterns, I've dedicated my time to crocheting, and it has really help me. I'm doing the cuddle me puppy for my niece's birthday. Is there any place where I can find the shirt pattern? I hope you're doing better, and thanks again for bringing joy when all I felt was sadness. Thank you so much! i just finished this pattern puppy as a request for my mom's friend's grandson who is turning 2 next weekend :) the feet had me for a loop for a while, but i got it done :) so easy to follow, i will be remembering this page for amigurumi patterns in the future for sure! thank you! This is the first amigurumi I started and actually finished as well. Thank you for the pattern an great tips. It came out beautifully.